Detailed course on additional rhinestones decoration methods. The skills you gain can be used in decoration of evening dresses, wedding dresses, corsets, prom or cocktail dresses or even casual garments. They are made of high quality plastic (acryl) and are very easy to work with. I glue them on with the same E6000 adhesive I used for applying rhinestones to the black corset in the previous tutorial. Each drop of glue should be a little smaller than the half pearl bead. Make sure to press the bead down very firmly. I also use the same rhinestone picker pencil and it works just fine even with large half pearls. I press the bead down with the other end of the pencil to stick it to the fabric properly. It looks particularly impressive when you use beads of different sizes: from the smallest to the largest! You can make rows of half pearls that gradually increase in size, mix them randomly, or choose a particular size to your liking. Of course, it makes a difference whether you use faux pearls or sew-on Japanese pearls: especially if you're sewing a dress for rent (which implies frequent wear). The coating of faux pearls eventually starts flaking while Japanese pearls stay as they are. These faux half pearls are a good choice for a dress which won't be worn often though. They do look just as beautiful. 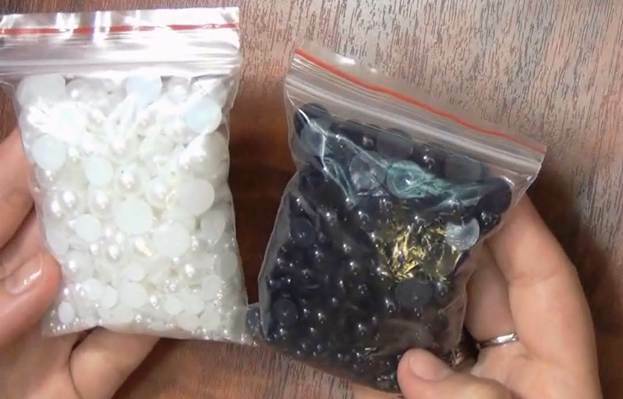 These pearl beads come in different colors. You don't need to sew them on and it's their greatest advantage. Gluing beads on is a lot less time-consuming. 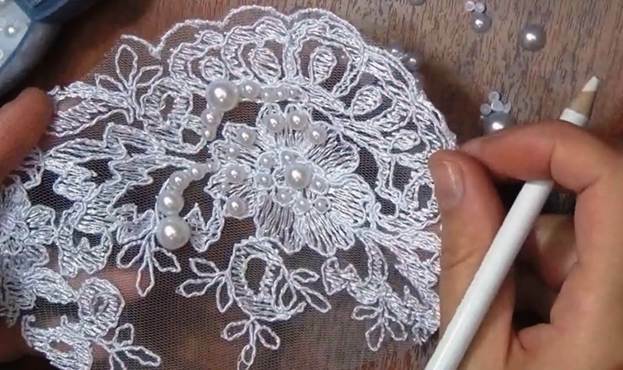 Let me take a sample piece of lace and show you how I glue these half pearls on. I put them on the table decorative side up. I just pour a generous amount of beads on the table and then turn over as many as needed. You can either work on a ready dress decorated with lace or on individual lace fragments which you are going to sew or glue on it later. The size of each glue drop should correspond with the size of the pearl. It's the tricky thing about this kind of work. 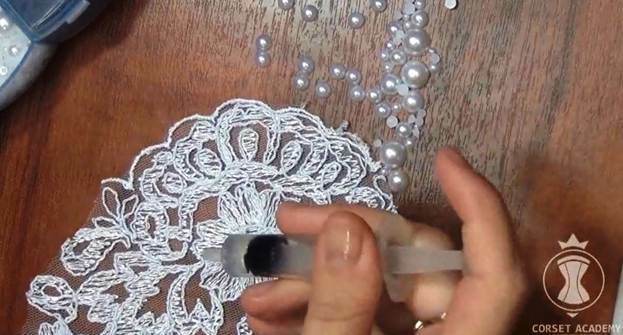 Make a larger drop for large pearls: when you press the pearl down, a very thin border of glue should appear along the perimeter. I am going to glue on a row of half pearls gradually decreasing in size. I make a row of glue drops – from the biggest to the smallest. Make sure to account for the size of each pearl bead and leave enough space between the glue drops. A garment fully decorated with such pearl beads will look very rich! But you should always think about the way the garment is supposed to look from a distance when arranging pearl beads into patterns. Never forget about it when applying rhinestones, gems, pearls, or other decoration materials to your garment. The layout is supposed to look good from a certain distance: a relatively big distance if we are talking about a wedding dress (think a wedding hall). If it's an evening dress, which implies face-to-face conversations etc, then the control distance should be smaller – literally just a couple of meters. Besides, you should account for the goal you pursue: i.e. do you want the pattern to be clearly discernible from the control distance? Or do you simply want to highlight the color of the lace or the main fabric? In the second case, you need to carefully choose decoration materials of a subtle matching shade. In other words, you should always think about the way the embellished garment will look from the distance the wearer will be mainly looked at. It therefore makes sense to prepare a test sample, put it on the dress, take a few steps back, and study it from a distance. If you are happy with the results, you can safely use this type of embellishment!